Santiago Solari loves Isco as a player but acknowledged it is difficult to guarantee the Real Madrid star game time unless he is at his best. Isco is yet to start in LaLiga under Solari and has struggled for form this season following a lengthy lay-off due to acute appendicitis earlier in the campaign. The playmaker made headlines in last Wednesday's 3-0 Champions League defeat at home to CSKA Moscow, appearing to make an angry gesture at the fans after being whistled. 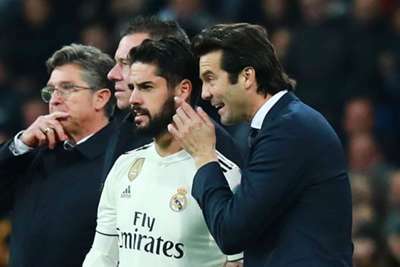 Although Solari insists he is full of admiration for the Spain international, he hinted Isco must improve his consistency to cement his place in the first team. "I love Isco," Solari told a news conference ahead of Madrid's Club World Cup semi-final against Kashima Antlers. "But my job is to make sure that everyone is at their best. Those that are not, do not get in. "It is a thankless and difficult task to choose who has to play and who is left out. "I see [Isco] and all the others, working with enthusiasm."